Yes, you saw that right. 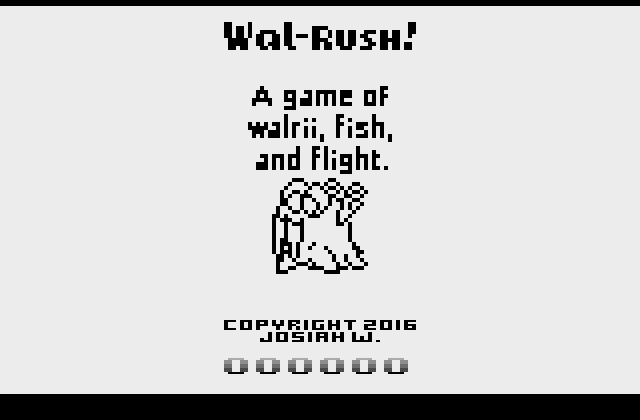 Wal-Rush!, my entry for CodeWalrus Contest #2...on an Atari 2600. I'm gonna let that sink in for a minute. Click the image for the latest version! Inspired greatly by the recent release of Zippy the Porcupine (I knew this game back when it was just a 1-level demo! 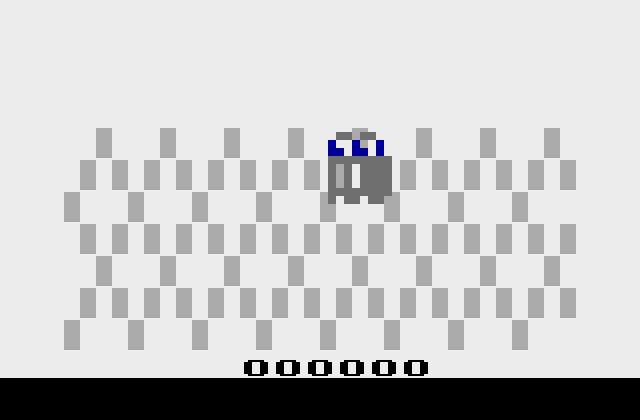 ), and the fact that Atari games are limited yet cool, I have decided to port my contest entry to the Atari 2600 using the programming language bAtari BASIC. I'm sure it'll be a natural game on the Atari 2600. As of now, I have a small demo, which I have attached along with the files I have used in the IDE, visual bAtari BASIC. The demo is playable in Stella or on a Harmony cartridge, and the file is named "Walrush.bas.bin" (in the "bin" folder). As well, the source code is viewable in any text editor, and the file is named "Walrush.bas". As it stands, this is meant to demonstrate the physics of the Wal-Rush! engine so far. For those who can't play the file, here is a (crappy) video I recorded of the demo. Use left and right to move, and fire to fly. What do you think so far? I can't wait until I get to play this on a Harmony cart on actual hardware! Once I get a real A2600 and flashcart, it'll be so amazing to actually play a game I made! Now, I have made the physics and controls a little better, and added OBSTACLES! Collision isn't implemented yet, but it will be soon. Here is a video showing the progress. The download is attached. Tell me what you think! Will the white on the sprites all ways be transparent? I have not discovered a way for it not to be. Technically, the sprites are only allowed to be one color, but I used one programming trick for making Walrii multicolored (which is still not perfect). I used the negative space on Walrii to make its tusks and eyes, but it's not perfect. Maybe you could make it so when something behind it shows through, it hides that pixel? So that way it would like white, but technically everything there would be transparent. Something I am curious about, though, is if a larger resolution Walrii sprite would be possible, with fewer colors? (1 color per line) I swear I saw Atari games with larger resolution sprites before. Also does Batari Basic allows you to draw lines and stuff? You could have the top of the screen being wavy like the trees in Pitfall. Another idea would be to make the background scroll but that would look choppy like in Princess Rescue. But the question is: How did you manage to draw a walrus sprite with more than 1 color per row of pixels? I thought the Atari only allowed 1. Do you just draw multiple sprites on top of each others or something? Sprites on the Atari are only allowed to be up to 8 pixels wide. If possible, could you direct me to the game(s) in question you say have larger resolution sprites? Make sure not to confuse "larger resolution" with "being drawn as a taller sprite", or simply "stretching it horizontally up to 4x the size with a sprite-graphics mode"
bAtari BASIC allows you to do what the Atari would allow you to do (doing something more complicated than the syntax allows can be remedied by inline asm code). The trees are still drawn with playfield graphics (from what I can tell), and the tiny details in the branches are drawn with sprites copied horizontally. Besides, I'm not actually sure what you want it to look like, then. I was going to make it scroll slowly to the right. And the answer to that last question: I can. EDIT: Here is a link on Pastebin to the code, if you're too lazy to view WalRush.bas in a text editor . The line "set kernel_option player1colors" near the top dictates that player 1 (which I have designated as the walrus sprite) is allowed to be multicolored (with the restriction of one color per row of pixels). There is also an option to make both player 0 AND player 1 multicolored, but I really have no use for that. I now have a somewhat-playable demo! 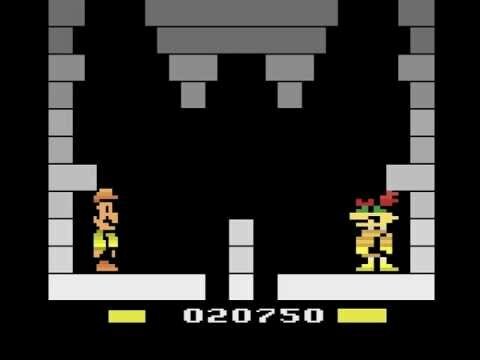 Once you either hit a mine or fall to the ground, you explode (sorry ), your high score is recorded if you have one, and it is saved until you turn the system off. After every game, your high score flashes in green, and the last score you got flashes in black. Of course, this is by no means a finished product. I plan to add sound effects, and maybe a catchy jingle to play somewhere. As well, I'd love to add the calculator invincibility powerup, if I can find a way to display your "invincibility meter". However, it is playable as it stands, and the source code is (hopefully) fully commented. If you would like to help me code, or offer suggestions of any kind, I'll gladly take them into account during development. Here is a video of the demo so far. The download is attached, as usual. Please, tell me what you think! Test this on both an emulator, and real hardware (NTSC) if you can!